L'Oustal du Viaur. Teillet, Pampelonne. 2 Self catering properties with fabulous views. Gites Jean Luzent. Saint Bauzeil, Ariege. 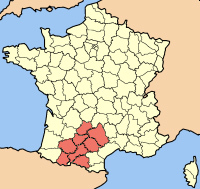 3 Gites in the Ariege Region. Prices from 290 euros to 410euros pw. Gite + B&B with swimming Pool. Cascatlan. Castex. Nr. Mielan. Gers. 3 Bedrooms. Sleeps 6. Changeover Flexible. 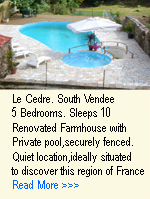 Comfortable B&B or Gite in the Midi Pyrenees. Prices from: £50 to £80 per night. La Riberre. Trie sur Baisse. Gers. Prices from: €500 to €800 pw. 5 Bedrooms Sleeps 10 to 16. Changeover Saturdays. is the ideal place to gather with Friends. Pretty gite, set in the gardens of Maison Esmeralda, right on the banks of the River Arac. 2 bedrooms, sleeps 6. Swimming pool and gardens. Prices from; 450€ to 550€ pw.